Think Twilight all grown up, with gothic horror, epic mythology, detailed terror and an underlying threat to the world hidden in ancient prophesies. Lucifer Rising is the third in Rebekah Armusik’s 13 Gothic Memoirs series, and the author’s tone reflects the unsettled heart of a misfit turned queen, mixing immaturity and awesome power in equal proportions. Honest concern for her fellow humans traps the mysterious queen Dija between goodhearted kindness and cruel vampiric torture, making her a constantly conflicted character while her emotions flip and change.The author’s series promises thirteen memoirs as Dija grows into her powers and, hopefully, finds salvation somewhere on a path between the religious goodness of Father, God’s absent betrayal, and the selfish cruelty of the lost. A scary tale with detailed pain and torture and much heart-searching, this novel fills in the next step of Dija’s adventure, bringing surviving characters forwards through death and death-dealing to a tear-jerker ending before the next book, and lifting parts of the veil on the past as it goes. The author jumps straight into the tale on page one, so readers should be sure to read the previous two volumes before embarking on this.Though it reminds me of Twilight, this isn’t teen fiction. The sexuality is underplayed, but sexual tensions, especially in vampiric feeding, are pretty clear, and the gruesomeness factor is high. The series is definitely episodic, and should probably appeal to those who wish their teen fantasy, mystery and heart-searching could be freed from the restraints of a PG13 rating.Disclosure: I was given a free ecopy of this novel in exchange for my honest review. I'm not sure where to start this review. I didn't enjoy the story as much in this third installment of the series, and there wasn't much that jumps out to me to say. Although the characters were certainly more interesting this time around. That awful Countess is back and she is certainly causing a ton of trouble in Nadija's family. Even though I don't like her, I can't help but be fascinated by her awfulness. We also learn alot more about Jozef, and it's not good at all. I loved reading the interactions between Nadija and James especially.Their relationship is getting quite complicated as they grow closer. There's no doubt that they love each other, but at times it seems like James wants more from Dija. I do admire for Dija for not giving in to temptation and remaining faithful to Alexei, but I do feel sad for James. He's a good man, and he needs someone who can return his feelings. I also think he'll make the perfect king, so I hope he gets his chance.Even though the story was a bit dragging for me, I'm still fully enjoying this series. I love the author's writing style, and she's given Nadija a very clear, strong voice. There was a surprise at the end which I wasn't expecting, but it definitely makes perfect sense. I can't wait to see what Nadija does with her new found knowledge in the next book!Read more of my reviews at Pinkindle Reads & Reviews. Those that are reading the review of Book three should be well informed about this Series by now. I can not effectively give an accurate review of this book, without giving too much of the story away, because the direction this story is going is incredible. The Characters are developed and very familiar at this point, and although they are all complex and emotional, we can all relate to every Character in this Series, because we all know someone who fits these Characters well. Naudia is a strong, proud, stubborn Queen that has finally grown into her skin. She has the will of a God, and her powers can easily back up her tongue at this point. How refreshing to see a main Female Character that is not a helpless, whiny sad case of a person. Naudia is the Heroine for the Ages, and will reign supreme in any battle.All Hail Queen Naudia! I loved this book, I love the whole series. I can't wait for the next one to be out, at Halloween.This is so different than anything I have ever read. A whole new take on angels and vampires. Not what you expect.The writing style is so beautiful. I was blown away. This whole series is a must read to me. I highly recommend it.Start with Memoirs of a Gothic Soul and then 2nd MariposaRebekah Armusik is an amazing writer. Truly gifted. Mariposa is continued through Lucifer Rising as additional circumstances and situations unfold in Nadjia's complex life, including an unexpected family twist with which she must come to terms with. Dark truths from the past of the Vlkolak people are disclosed along with a profound revelation explaining the deep love between Nadjia and Alexei. Rebekah Armusik has done it again! Her brilliant story-telling leaves me mesmerized with each surpassing novel and I am left yearning for the next installment. Loved the book! Rebekah outdoes herself once again! I enjoyed traveling on the journey of Nadija and meeting new characters. the emotions behind her words are impeccable and it was hard to stop reading! I love the stregnth to Nadija, it is so refreshing form other books where the woman is such a victim. If you have not read the 1st 2 books, YOU MUST! Each book only gets better and better, if that is possible! I cannot say enough how much I am enjoying this series... Writer is a local gal using local references which I enjoy immensely... I can't wait to read the next book! Rebekah Armusik Diana Forbes Eric Armusik - Rebekah Armusik attended King's College, where she majored in literature. Shortly after graduation she began writing Memoirs of a Gothic Soul. At first, the novel was more of an autobiographical project that centered on her eccentric Slovak family and her experiences in Northeast Pennsylvania, but soon her grandmother's haunting tales became the focus of the book. Before long, Rebekah's love of the Gothic novel began to change the direction of the series. Working from the original layout, she began feverishly re-working the tale. In August 2010, she chose to self-published Memoirs of a Gothic Soul and quickly established a loyal fan base eager to read more. Her second novel, Mariposa opened to rave reviews on Halloween 2011. 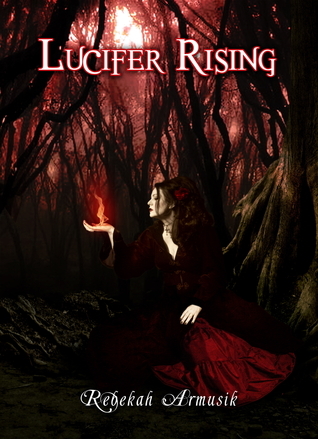 In 2012, Rebekah released two novels in one year, Book 3: Lucifer Rising and Book 4: Vlkolak King. In 2013, Rebekah released her most acclaimed book in the series, to date, In the Shadows.Her novels have been best sellers in the Gothic romance and supernatural fiction categories on amazon. Since the release of her last novel in the Gothic Memoirs series, Rebekah has been hard at work on her latest project. She has recently finished the first novel in her new supernatural series and is currently working on the next book. Rebekah lives in Pennsylvania with her husband, Classical Painter, Eric Armusik, their three beautiful children and two very handsome, black cats. Rebekah has been featured in numerous publications including Gothic Beauty Magazine, The Weekender, Victorian Homes Magazine, Berks County Living, Old House Journal and The Reading Eagle.